"For me it’s been all about strength and confidence. And I like that my daughter gets to see that strength." Pursuit Fitness and Performance (PFP) attracts a lot of couples who like to work out together. A more unique family combo? The mother/daughter pair of Liz and Jillian Alexander. She’s been a member since. Jillian, just 12 years old at the time, heard her mother rave about her experiences at PFP. As a club soccer player who was already tall and still growing, Jillian and Liz were interested in learning about ways she could avoid injury as she entered her high school years. PFP seemed like the perfect fit. “I tried it and I ended up loving it and it’s literally one of my favorite places,” says Jillian, who is now 14. 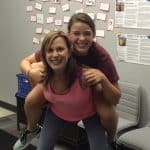 Liz continued with her group training sessions, while Jillian worked on personal training specifically designed for a high intensity soccer player. Shortly after the two started working out there together, another challenge presented itself. Liz was diagnosed with breast cancer. Liz opted for a double mastectomy, so even as Jillian continued to attend, Liz had to take a break from PFP. J: Everything—I do not dislike any exercise. I will do anything they tell me to do, joyfully! Go to breakfast: Eggs for everyone! L: I’m just grateful that we’re at PFP and that we’ve met the people that we’ve met. It’s been an enhancement to life in such a positive way.